We live in San Bruno, Ca – about 20 minutes from San Francisco. Nothing much happens here. But it did last night and it will live in our memories forever. As I watered the garden last night at around 6pm, an eerie rumbling sound came over me. It was like a plane was about to land on us. I looked up and saw a huge fire ball erupt in the near distance and I ran inside to meet Mike and the kids and I screamed “fire ball”. I thought it was coming towards us like a nuclear bomb. I thought the world was ending right there. I called 911, but it was busy. And so began a very long night. What they thought was a plane crash was said to be a gas station exploding up the hill – less than a mile from us. But no, it was a gas line. You could hear the gas roaring for hours. The news didnt know what it was for a long time, but they were showing the devastation via helicopters. This was just up the street. We got calls to evacuate.. Then the entire neighborhood lost power. We had a rough night of sleep not knowing what we would awake to find but we knew it wasnt going to be good. And it isnt. Lives have been lost and many homes leveled to the ground. It is surreal and it reminds me of the images from Sept 11, 2001. Except this time it was in my backyard. We are fine. 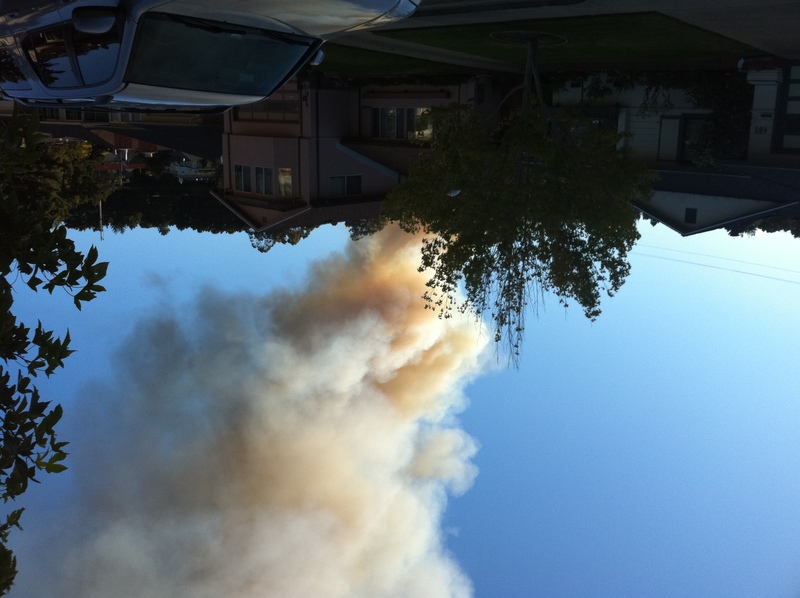 But our hearts go out to the people of San Bruno who are affected by this nightmare.